Finishing hems with bias tape is a great alternative to folded hems because your original garment length will remain. 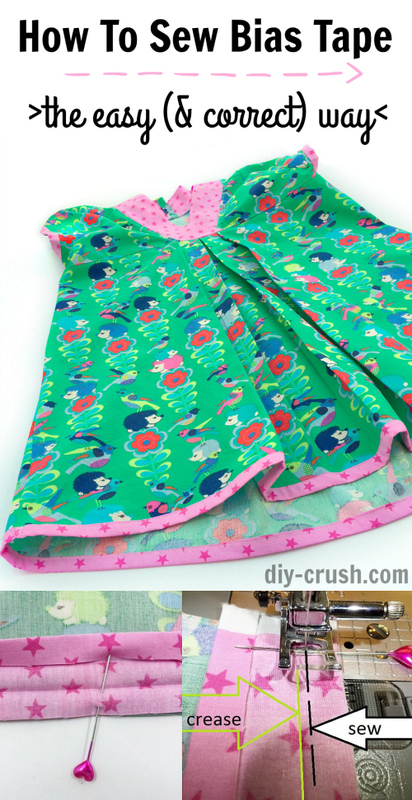 See how to sew bias tape the easy (and correct) way. Bias tape can be purchased already packaged at craft and fabric stores or online in different colors and different widths. My favorite bias tape is handmade because I can make it to match the project much better and I already know the quality of the fabric instead of trying to match store bought bias tape. See my previous post of how to make your own bias tape. But how is bias tape sewn on? I think I can say with certainty that the way I’ll be showing you is the correct way. Oh that sounds so teacher like, doesn’t it? No really, I had to learn this method a long time ago after I got frustrated after only sewing bias tape for couple of times. I always did it wrong. What I did was, I pinned the folded bias tape to the hem (the hem was sandwiched in between the bias tape) and went straight to sewing it. The front always looked great but the back never did. Often times my stitches didn’t catch the bias tape on the underside which left me to decide whether or not I should unpick the stitches and try again or if I could get away with leaving the underside look like that. Oh boy! I’m so glad I learned it the correct way soon after! The shirt I am adding bias tape to is the Ma Cherie Tunic, a great pattern by Winter Wear Designs. 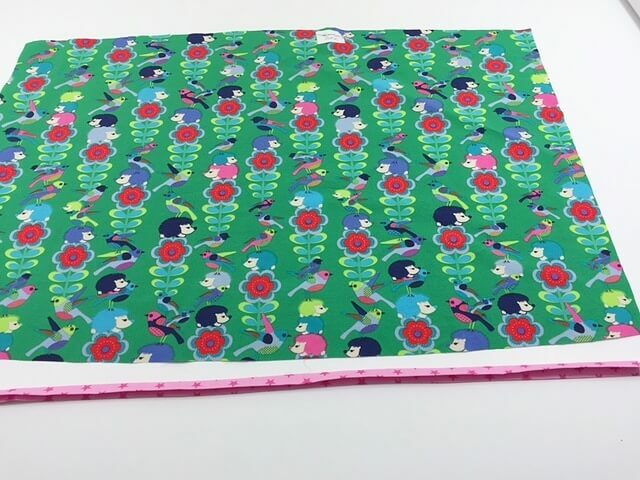 The absolutely darling fabric combo is from Mabel Madison, a supplier of high quality poplin fabric. 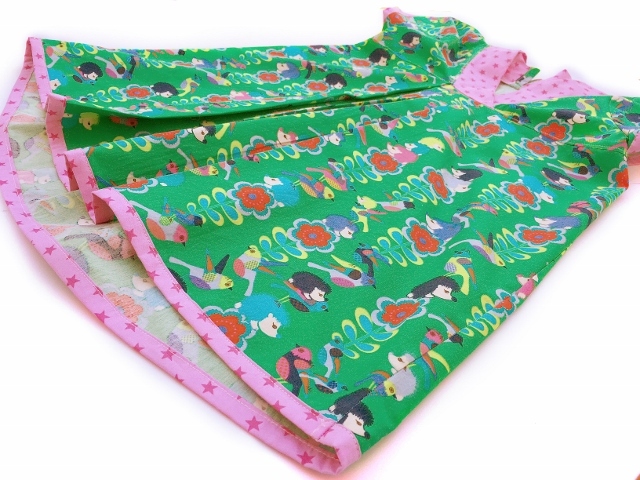 BTW, if you haven’t sewn with poplin fabric, read all about it HERE. So, the reason I wanted to add bias tape to the already super cute Ma Cherie Tunic was, because I loved the star print fabric that much that I wanted to have it on another place on this tunic besides the neckline and sleeve hems. You can literally add bias tape to anything you like that doesn’t have ruffles (although you could add it to ruffle hems if you really would like). The only modification you want to make is to adjust the length, that is important for garments that should fit correctly in length such as tops, dresses, skirts and pants. This tunic normally has a folded hem so I took off the seam allowance from the fabric and that was it. It was ready to get bias taped. NOTE: my “bias” tape in this post is actually NOT cut on the bias. A reader made myself aware of that I never mentioned that lol…so thanks!! You can cut a simple strip of fabric along the edge if you are not using it on curved edges!! For curved edges you should cut it on the bias. Step 1: Place the bias tape (or straight cut fabric tape) underneath the fabric with the two folds facing down and the single fold of the bias tape facing up, towards the fabric. Step 2: Flip your fabric over so the right side is facing down (I know, I should have done this already in the above image). Move the bias tape over the fabric and unfold the bottom fold. Pin in place. Be sure that your bias tape’s right side is facing the wrong side of the fabric. Step 3: Continue pinning the entire bias tape for that piece of fabric. Use plenty of pins. 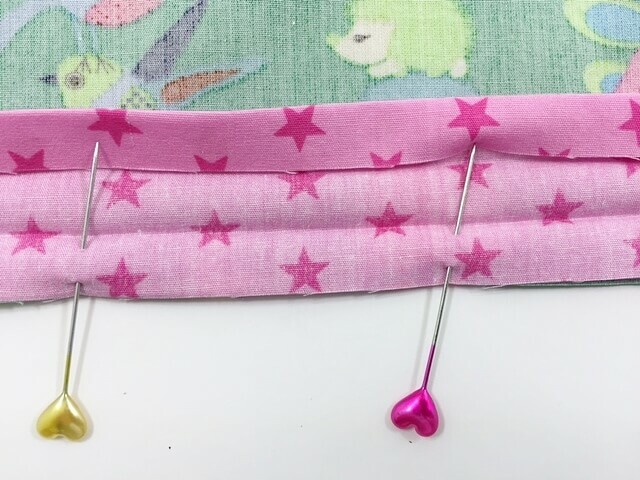 Here is a close-up of how the bias tape is pinned to the wrong side of the fabric. The upper fold of the bias tape is still folded. Step 4: With a straight stitch on wovens and a stretch stitch on knit fabrics, sew along the RIGHT side of the fold/crease. You can keep a seam allowance of 1/16 – 1/8 of an inch. Just don’t sew along the crease, only right next to it. 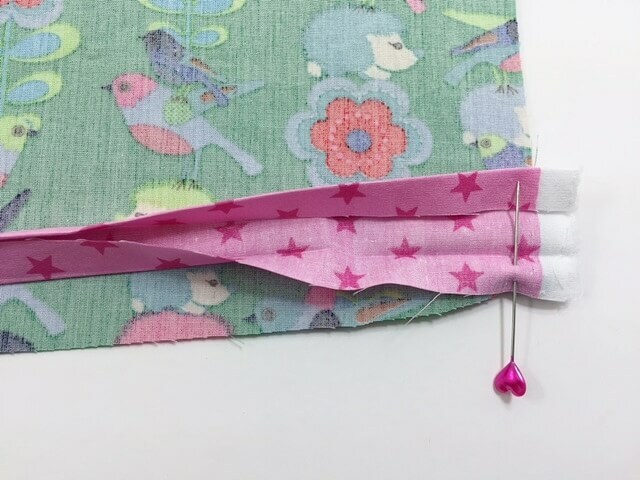 Your tutorial makes working with bias tape look simple! Thanks for sharing with us at Creatively Crafty! I’ll be sure to pin this. I’m sure it will be helpful for many people. Great tips on working with tape. Thanks for sharing! Just realized I had been using bias tape the hard way all this time. This was a great, easy to understand tutorial. Thanks for sharing. I have avoided at all costs using biased tape! I always did it a much harder (much more aggravating and unpolished) way. This is a simple commonsense way to use it thank you! Great tutorial but a tad confusing when calling the tape bias when clearly the fabric of the tape had not been cut on the bias. I accept that you used a sample piece of fabrics however could be very misleading to sewing beginners. Yes, you are right! I never mentioned that my “bias” tape was not cut on the bias. I amended the post. Thank you! I also suffer through ugly, wrong side bias tape issues! Thank you for this! I’ll be trying it you way very soon. This finally makes it so clear! I’m saving this link for the next time I’ve got to use bias tape. Great tips! Just with the last step, what seam allowance do you topstitch with? Or does it not matter because you will always catch the underside? Well. This is so perfect and easy to understand! Thank you! Thank you so much, Nancy! I appreciate your visit! Please forgive me from interfering – I am so old school, i.e. early 1960’s (if not late 50’s). I was not only taught to sew by hand, with the rare treat of taking a turn to use the single hand sewing machine. We had to line up the tape/bias tape right sides together. The complete reverse of your picture. Sew along the crease, fold the tape under and then slip stitch. This had to be under the line of machine stitching. No hand stitches were allowed to show on the front of the garment . Slow I know but a perfect finish for that special garment. Sorry not “techy” enough to demonstrate with examples. That is the way this task was taught, I believe it! I remotely remember that from my mom actually. Thanks so much for visiting today! The problem with sewing along the crease is you have left nothing for turn of the cloth, which can leave a rather messy looking turn. 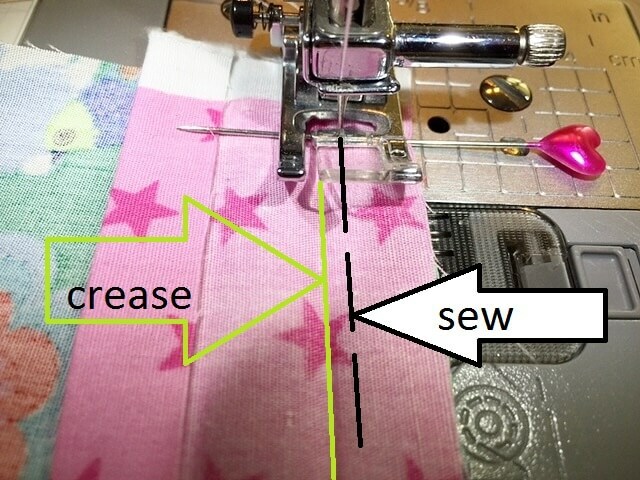 I sewed bias tape (or non bias on straight edges) exactly the way it was demonstrated here until sewing machine companies came out with bias tape feet. With these feet there is no need to pin and your machine will catch both the top and bottom layers at the same time. The only problem is that those feet are pricey, so unless you have sufficient disposable income and/or sew a lot of bias tape, they may not be worth the money. Me too! I love having a bias tape foot as it makes the project take half as long and results in a well sewn project! Thank you for explaining why you don’t sew along the crease. I was looking for this in the text above. I was reading the comments hoping it would be mentioned. I teach kids to sew and didn’t know this, They often want to know “why” they have to do something, and I admit I do too. Thank you for reading this post! That is a very good question that I need to add in there. The reason to NOT sew along the crease is that you will have a little bit of extra room once you fold the binding over. 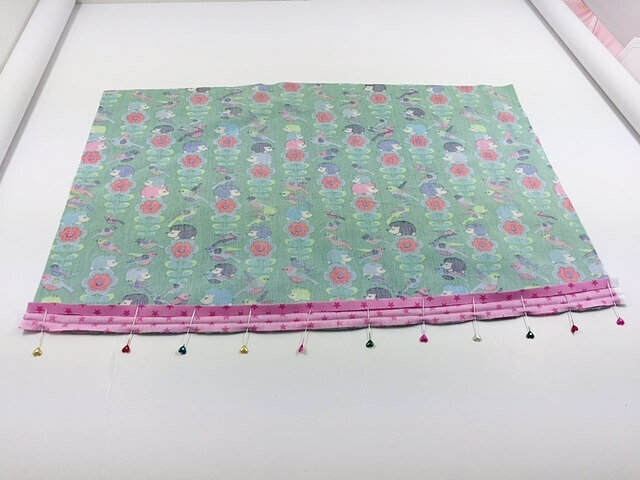 Otherwise, if sewn along the crease, your binding fold may not allow for the necessary room to cover the stitches on the other side. I like to even trim off some of the seam allowance to achieve less bulk as well. This step helps me to get a nice and neat looking binding. This method from the wrong side is great if you want to show the contrast fabric however often times bias tape is used as a hidden finish. You do the same technique right side to right side and finish on the wrong side concealing the bias tape from the right side. Yes, correct! So happy you stopped by!! Love your pictures and detailed tutorial that makes it look so pretty and easy! Can I ask what pattern the beautiful dress was made from. Love it and want to try it out with a pattern like that. Sorry , saw the name of the pattern after writing my comments. Hey, no problem! Thank you for reading this post! I’m glad you like the tutorial and pattern! I can not say thank you enough ! I am making a porch valance and this is so much easier ! So happy my tutorial helped you!! Happy sewing!